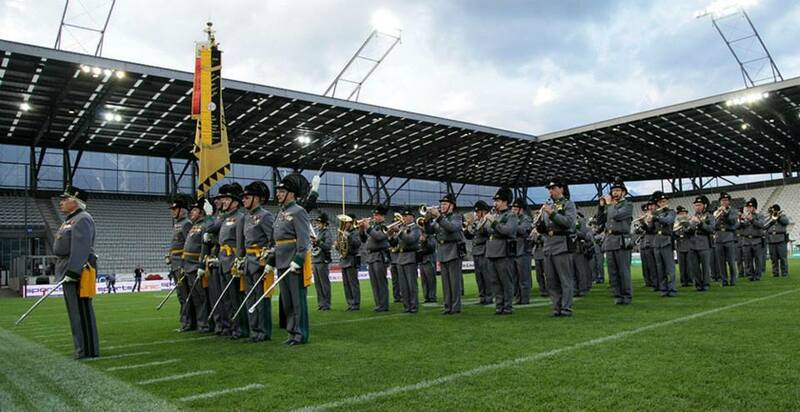 The SWARCO Raiders have lost Eurobowl XXVII. 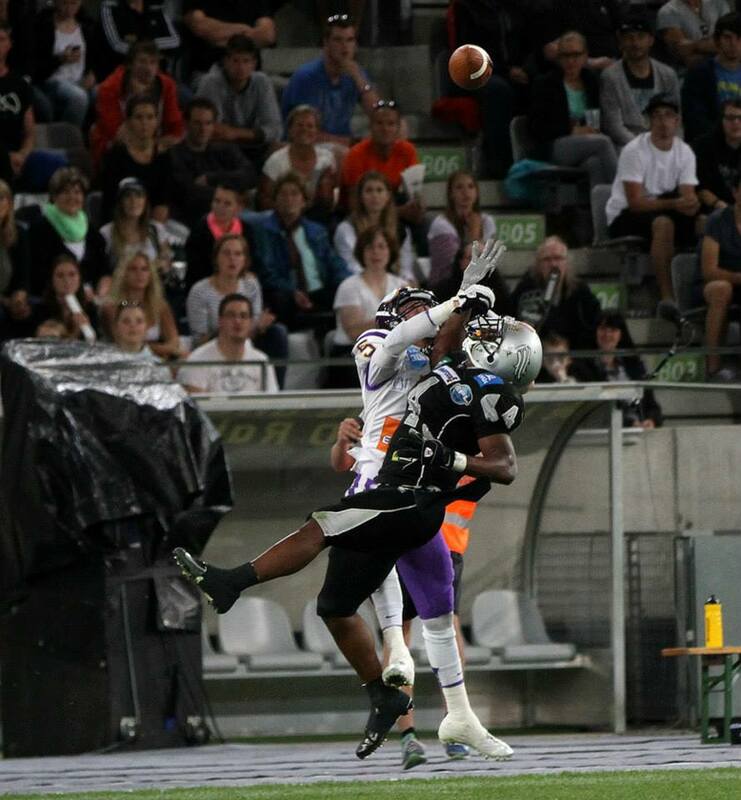 In the European Football League’s (EFL) final they fell 37-14 (0-7; 0-16; 14-7; 0-7) to the Raiffeisen Vikings Vienna. In their fourth championship game for the European crown the Tyroleans experienced their first finals loss. Vikings QB Christoph Gross was named the game’s MVP. „Congratulations to the Vikings for winning the title. They played a flawless game today“, said SWARCO Raiders head coach Shuan Fatah. „On the other hand we made too many mistakes today, which cost us the chance to win. Now we have to get back up and fight, because our season is far from over“. SWARCO Raiders QB Kyle Callahan completed 18 of 39 passes for 256 yards with one touchdown pass and one interception. He also scored on a running play. RB/DB Jaycen Taylor caught 4 balls for 92 yards and one touchdown. He also had 108 return yards. WR Talib Wise caught 2 passes for 28 yards and had 8 rushes for 32 yards. The SWARCO Raiders won the coin toss, but eleced to defer. After WR/K Clemens Erlsbacher’s kickoff and touchback the Vikings started at their own 25. RB Jesse Lewis gained 17 yards on the first play from scrimmage. With two more runs he moved the ball tot he Tyrolean 19. From there Gross threw a 19-yard touchdown pass to WR Larinho Walch. K Sebastian Daum added the PAT to give the Vikings a 7-0 lead with 9:55 minutes left in the first. The Tyroleans first drive ended with a punt. But after the Vikings also had to punt the SWARCO Raiders took over at their 20. Wise ran for 10 yards on first down. Later Taylor caught a 7-yard pass from Callahan, who then found WR Julian Ebner at the Vikings 41. But after an incomplete pass on fourth down the Vikings took over at their own 37. On first down Gross found Walch for 28 yards. After a penalty against Vienna Gross threw a 45-yard touchdown pass to WR Michael Zweifel. Daum’s PAT extended the Vikings lead to 14-0 with 11:37 minutes left in the second. Taylor returned the ensuing kickoff to the 28. After a sack the SWARCO Raiders faced a third down an 20. Callahan found Erlsbacher for 30 yards. But on the very next play the Vikings blocked Callahan’s pass at the line of scrimmage and DL Alexander Taheri picked off the ball and ran 45 yards for a touchdown. The two-point conversion try failed, but the Vikings were up 20-0 with 9:46 minutes left in the second. In the following minutes both teams neutralized each other and punted twice each. But on Vienna’s second punt Taylor muffed the catch and WR Stefan Holzinger recovered at the 10. The Tyrolean defense didn’t allow a touchdown, but Daum’s 18-yard field goal extended the Vikings lead to 23-0 with 50 seconds left in the second. The third qarter started with a quick strike by the SWARCO Raiders. Taylor returned the kickoff to the 40. On the second play from scrimmage Callahan looked for Taylor and found him for a 60-yard touchdown pass. Erlsbacher’s extra point was no good, but the Tyroleans cut the Vikings lead to 6-30 with 11:07 minutes left in the third. After a touchback on the ensuing kickoff Vienna started at its own 25. On second down Gross found Holzinger at the Tyrolean 23. A few plays later the quarterback threw an 11-yard touchdown pass to WR Manuel Thaller. The PAT gave Vienna a 30-6 lead with 7:50 minutes left in the third. After a penalty on the kickoff the SWARCO Raiders began their next drive at their 8. A run by RB Lukas Miribung and later a pass to Wise resulted in first downs. After a 9-yard run by Callahan the Tyroleans showed punt, but DB Markus Krause ran a fake for a first down at the Vikings 47. Later Callahan found Wise at the 33. Then the Vikings batted a Callahan pass, but somehow the ball ended up in the hands of WR Damaso Tarneller, who ran to the 4. The drive ended with a 2-yard touchdown run by Callahan. Wise added two points to cut the Vikings lead to 30-14 with 28 seconds left in the third. After another touchback on the kickoff Vienna started at its 25. Two rushes by Lewis moved the chains to the Tyrolean 45. Then Gross found Walch at the 30. A few plays later Lewis scored on a 1-yard touchdown run. Daum added the PAT to give the Vikings a 37-14 lead with 7:38 minutes left in the fourth. Next Saturday, July 13 the SWARCO Raiders host the JCL Giants Graz in the semifinals of the Austrian Football League (AFL) playoffs. Kickoff at Tivoli Stadium is at 8:00 a.m. PT (5:00 p.m. CET).